Join us this week as we welcome country music singer songwriter George Ducas. Hailing from Texas City, Tx., George has enjoyed success as a national artist, international artist, and back home as a Texas Music artist, charting six singles on Billboard Hot Country songs, including two albums on Capitol Records and a string of hits like his Top 10 single “Lipstick Promises”. Ducas’ latest single, the summer stomper “Cowtown”, recently hit the Top 10 on the Texas charts. He has also been cranking out hits for other artists. His songs have been recorded by Garth Brooks, Trisha Yearwood, Gary Allan, George Jones, Dixie Chicks, Randy Rogers Band, the Eli Young Band and Sara Evans, who scored a No. 1 hit with Ducas’ “A Real Fine Place to Start". In exciting news for the fall of 2013, George will be releasing his brand new album "4340" on October 29th, 2013. We will talk to George about his upcoming schedule, get a behind the scenes look at his music, feature songs from his brand new album, and ask him to share his message for the troops. 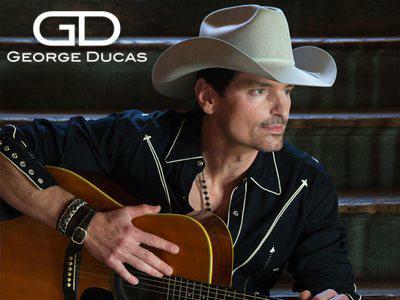 Please be sure to visit George Ducas at http://www.georgeducas.com/ and spread the word. Fans are welcome to call in and speak live with with George during the show (718) 766-4193 If you would like to participate in the live chat during the show, you must sign up on the show site first and then log in during the show. More great music for a really great cause! And as always we will give shout outs to our deployed military listeners. This is sure to be a terrific show so be sure to join us, Sunday October 27th 2013 at 4:00 PM EDT! Our message to the troops....WE do what we do, because YOU do what you do.